Perl Builder is a complete integrated development environment (IDE) for Perl. 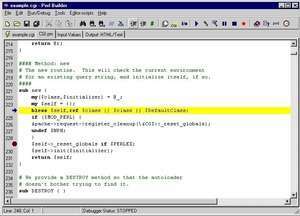 Key features include a visual editor/debugger that is similar to products such as Visual Basic and Delphi. The CGI Wizard component lets both novices and experienced programmers create powerful scripts visually, without writing code. CGI simulation lets you run, debug, and test scripts on the Windows 95/98/NT/2000 desktop--without the need for a Web server. Perl Builder 2.0m is a shareware program and can be used as a demo to try the software until the free trial period has ended. A full version of the program is available after the trial period ends. For security reasons, you should also check out the Perl Builder download at LO4D.com which includes virus and malware tests. Additional screenshots of this application download may be available, too. 3.2 out of 5 based on 3 ratings.